Charles I, Keeng o Scots (19 November 1600-30 Januar 1649) wis Keeng o Scots as Charles I, an Keeng o Ingland an Keeng o Ireland as Charles I forby. 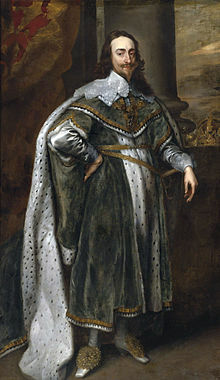 Charles wis born intae the Hoose o Stuart as the seicont son o Keeng James VI o Scotland, but efter his faither inheritit the Inglis throne in 1603, he muived tae Ingland, whaur he spent muckle o the rest o his life. He becam heir apparent tae the thrones o Ingland, Scotland an Ireland on the daith o his elder brither, Henry Frederick, Prince o Wales, in 1612. An unsuccessfu an unpopular attempt tae mairy him tae the Spaingie Habsburg princess Maria Anna culminatit in an aicht-month veesit tae Spain in 1623 that demonstratit the futility o the mairiage negotiations. Twa years later, he mairied the Bourbon princess Henrietta Maria o Fraunce insteid. Efter his succession, Charles quarrelled wi the Pairlament o Ingland, that socht tae crib his ryal prerogative. Charles believed in the divine richt o keengs an thocht he coud govren accordin tae his awn conscience. Mony o his subjects opponed his policies, in pairteecular the levyin o taxes withoot pairlamentar consent, an perceived his actions as thae o a tyrannical absolute monarch. His releegious policies, coupled wi his mairiage tae a Roman Catholic, generatit the antipathy an mistrust o reformed groups sic as the Inglis Puritans an Scots Covenanters, that thocht his views too Catholic. He supportit heich kirk ecclesiastics, sic as Richard Montagu an William Laud, an failed tae aid Protestant forces successfully in the Thirty Years' War. His attempts tae force the Kirk o Scotland tae adopt heich Anglican practices led tae the Beeshops' Wars, strenthened the poseetion o the Inglis an Scots pairlaments an helped precipitate his awn dounfaw. Frae 1642, Charles focht the airmies o the Inglis an Scots pairlaments in the Inglis Ceevil War. Efter his defeat in 1645, he surrendered tae a Scots force that eventually haundit him ower tae the Inglis Pairlament. Charles refuised tae accept his captors' demands for a constitutional monarchy, an temporarily escaped captivity in November 1647. Re-impreesoned on the Isle o Wicht, Charles forged an alliance wi Scotland, but bi the end o 1648 Oliver Cromwell's New Model Airmy haed consolidatit its control ower Ingland. Charles wis tried, convictit, an executit for heich traison in Januar 1649. The monarchy wis abolished an a republic cried the Commonweel o Ingland wis declared. The monarchy wis restored tae Charles's son, Charles II, in 1660. This page wis last eeditit on 16 Dizember 2017, at 07:43.